McKnight’s Senior Living Online Expo starts this morning! The McKnight’s Senior Living Online Expo kicks off this morning at 11 a.m. EDT with a timely presentation by Stan Szpytek, president of Fire and Life Safety and a retired deputy fire chief / fire marshal. “Disaster Preparedness 101: Is Your Community Ready?” will examine emergency management concepts and practices to help your team be better prepared for real-world, life-or-death situations. Two more sessions on hot topics will follow — one at 1 p.m. EDT on dementia progression by Sue Kruse, RN, director of clinical education at Silverado, and the other, “The Value of Culture and Communication in Senior Living” at 2:30 p.m. EDT, by Juniper Communities founder and President Lynne Katzmann, Ph.D.
Attendees will be eligible for one continuing education credit for each educational session they attend. A virtual trade show exhibition hall, featuring products and services from leading companies serving the senior living profession, will open at 10:30 a.m. EDT. Webinar attendees are encouraged to visit the booths before and after the sessions. All activities and continuing education sessions affiliated with the Online Expo are free to attendees. Learn more and register at www.mcknightsseniorliving.com/June13expo. 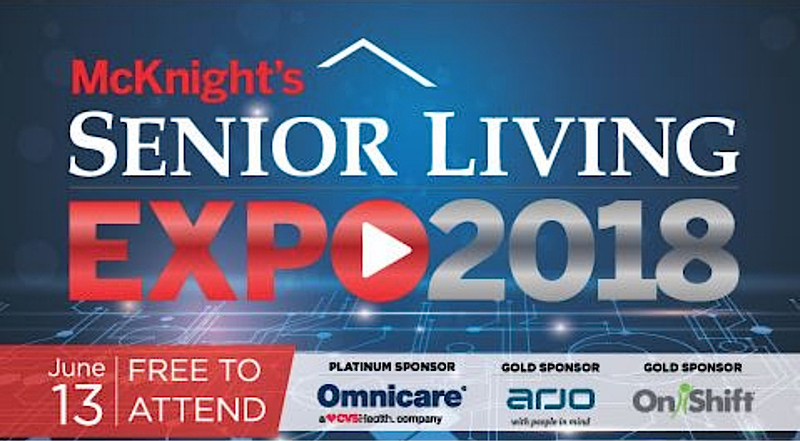 Close more info about McKnight’s Senior Living Online Expo starts this morning!